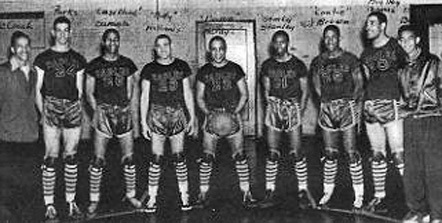 In 1944 the North Carolina Central University basketball team and Duke University’s medical school team defied Jim Crow laws and the mores of the time to play an interracial game. No spectators were present and the gym doors were barred. The game has since been dubbed “The Secret Game” as it was kept under wraps for decades, until New York Times writer and sports historian Scott Ellsworth exposed the story in 1996. Duke and NCCU students already met covertly for prayer meetings, and it was at one such meeting that the challenge was issued. Spurred on by guard Jack Burgess, an anti-segregationist Duke student, Duke’s team accepted. The game was to be played at NCCU’s small brick gym on a Sunday in March when most of Durham and its police force would be in church. Duke’s team wound through town in borrowed cars to avoid being followed and entered the gym with their jackets pulled over their heads. After a shaky start, NCCU’s youngest player, Aubrey Stanley, recalls, “About midway through the first half, I suddenly realized: ‘Hey, we can beat these guys. They aren’t supermen. They’re just men like us. '” NCCU won 88 to 44.